What started out as a trickle in early June has become a steady stream of phone calls on a daily basis now. People are telling us that they are tired of watching the violent, daily changes to their investments. They want to diversify some of their funds into an asset they have long term confidence in and that will give them short term pleasure. 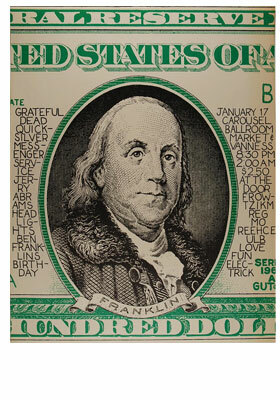 For a growing number of collectors, rare 1960’s Rock Concert posters fit the bill perfectly! It’s widely acknowledged that these incredible works of art are now trading at literally pennies on the dollar when compared to more established collectibles markets like coins, stamps, comics and baseball cards. Not only do these posters represent a rock solid value, they also provide wonderful enjoyment when displayed in your home or office. Make no mistake about it, this superior value proposition of these posters is only temporary and prices are correcting upwards as the tiny available supply is being overwhelmed by a steady, growing demand. This upward trend in prices started slowly about 5 years ago and has been picking up steam of late. In addition to demand from diversification, prices are moving upwards for Mint Condition posters as condition/state of preservation continues to be more appreciated with each passing year. These posters were produced in tiny quantities and not many have survived in undamaged condition. It’s universally recognized that the best investment most people make is in their own home. Do you know why? Because there is no way to get a daily quote on the value of your home and there is no way to sell it with the push of a button. This means they don’t call their real estate broker up in a panic to sell if the market is temporarily soft. People stick with their home for the long haul. This means that the way the market is structurally set up encourages people to do the right thing and ultimately come out way ahead. The same can be said for collectibles in general and for concert posters specifically. Pick up a few choice items, enjoy their ownership through the years, and watch the desirability and appreciation for these rare artworks steadily grow. The value will always be there and you will find their ownership thoroughly rewarding every step of the way! You’ll sleep a lot more soundly too!